22 Red Bluff 2013 Rich with History The city of Red Bluff was founded in the 1850s and was incorporated in 1876. Its permanency was secured when it became the ���head of navigation,��� meaning it was located as far north on the Sacramento River as steamboats could travel. The steamboats began arriving in 1852. When gold was discovered in 1849 by Pierson B. Reading in the Trinity River, it was not long before gold seekers began coming north to seek their fortunes. Red Bluff was the drop-off point, where men and supplies left the Sacramento River and continued north by land. The early economy of the town was based upon the ability to provide for the travelers passing through. These early businesses ranged from the Luna Hotel, 1853 to the Red Bluff Brewery 1859. Red Bluff takes its name from the red bluffs upon which it was built. The town was situated in an ideal spot for early settlers, as it was above the malaria-infested marshes of the river and the frequent flooding of the Sacramento. With the coming of the railroad in 1871 and the growth of agriculture and the lumber industries, the area grew and stabilized during the latter half of the 1800s. The city has always been well positioned to take advantage of transportation within the state, no matter what the mode. The steamboats led the way, to be followed by the railroad, U.S. Highway 99 in 1910-1915 and Interstate 5 in the 1960s. In 2007, it continues to be a hub for distribution of goods in Tehama County, as well as throughout the state and beyond. Although the lumber industry has dwindled in Tehama County, the milling of wood by-products is a major industry in Red Bluff. Sierra Pacific Industries has two plants in Red Bluff that ship millwork all over the United States. The Louisiana Pacific Corp. also has a local plant, the company���s only plant in California, employing about 60 workers. Visitors will find the city offers a glimpse back in time with its Victorian homes built between the 1860s and early 1900s, historic courthouse and turn of the century buildings along Main Street and throughout the downtown area. Not all of the city���s historic buildings have survived. The Red Bluff Opera House was built in 1908 and opened in 1909 at the corner of Oak and Washington streets. A 1925 fire damaged the I.O.O.F. Building, which served as City Hall, and the opera house, which was rebuilt in 1929. The State Theatre took over the site and suffered its own fire in 1944. It was rebuilt in 1946. The Cone-Kimball building, built in 1886 with a majestic clock tower, burned in 1984. Today a massive replica of that clock tower adorns the corner of Walnut and Main streets that is visible from the Interstate. The Freeman Building, built in 1923 by A.J. Freeman, still stands but is now known as the Crowder Building. It suffered some damage when a building next to it burned in 1984. In 2006, the city lost the Countryside Deli building, formerly home to The Chicken Shack. The restaurant had hosted many famous patrons, including Bing Crosby, in its glory days when Main Street was a portion of Highway 99. 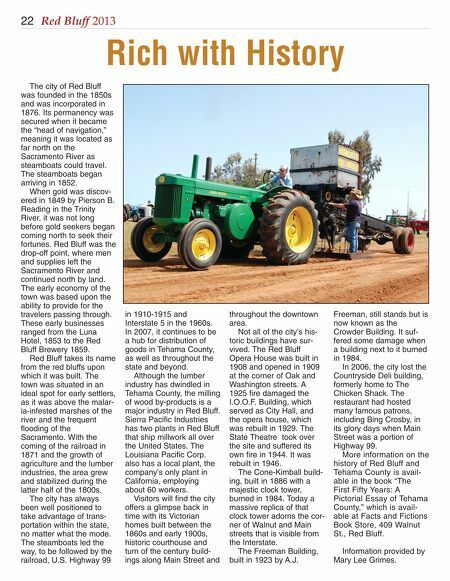 More information on the history of Red Bluff and Tehama County is available in the book ���The First Fifty Years: A Pictorial Essay of Tehama County,��� which is available at Facts and Fictions Book Store, 409 Walnut St., Red Bluff. 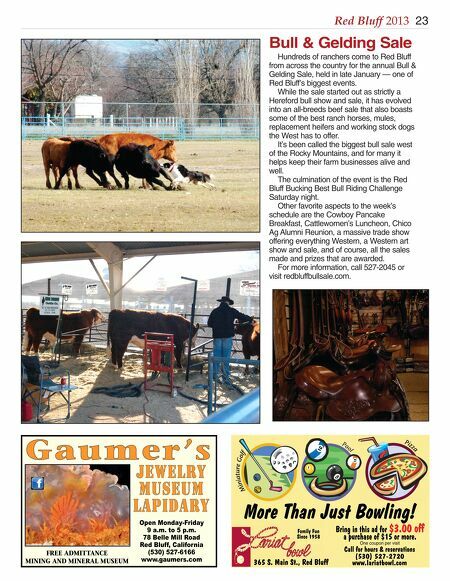 Information provided by Mary Lee Grimes.